WHAT will be attempted in these sketches will be a short account of some saints, known to the writer, who, while quite as heroic as some more popular characters, moved in much more limited spheres. I hope I shall not be accused of filial partiality, if, first of all, I name one with whom I associated from my birth. My father was a true saint, and one of the meekest spirits whose life and service ever adorned a village church. I have the less scruple in putting in the front the name of Robert Vaughan because – at the time of his death no memoir of him appeared in any of our church literature. Yet he was worthy. His deep and unaffected piety, his strict conscientiousness, his kindly spirit, his unostentatious service to our church entitle him to some slight recognition. The scene of his life and service, and of our early years was in the famous Oswestry Circuit, since divided into four. Our interest centred in the Moors Chapel. A good mile from this suburb of St. Martin’s was the hamlet – Rhosygadfa, – a name to be found on no map – in the centre of which was located a little thatched cottage, of very limited accommodation, and from the hearthstone of which on looking up, it was not impossible to study the stars. This humble cottage was the abode of Robert Vaughan. Though void of all architectural pretensions this dwelling was pre-eminently “The House of God.” Morning and evening prayer was made unceasing for the family, and for the church. My father’s tremulous voice, my mother’s more earnest tones went up in supplication, with strong crying and tears unto God on our behalf. The effect of these prayers has ever followed us, and is a precious heritage. Before I was born my father was called to the office of local preacher. The Rev. 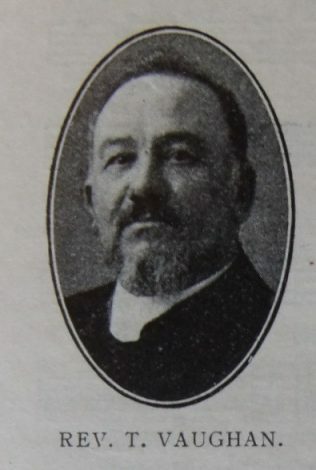 Reuben Brown brought the requisite missive from the Quarterly Meeting, authorising him to preach the Word of Life in the villages. Never did such a commission come to one who accepted the position with a humbler estimate of his own fitness for such a work. The letter was laid before the Lord, and the work accepted with fear and trembling. By continued prayer and searching of the Scriptures, he filled the office for the long period of forty-five years. Following the plough, brushing the hedges, scraping the roads, and breaking stones were the avocations in which the beaten oil was prepared for the Sanctuary. His recognised abilities were not such as entitled him to be planned in the Circuit town, but of this there was no complaint. It was never thought of. Such an appointment would have over-whelmed him. We all knew at home, when he went into the chamber, before setting out for his appointment, that he was seeking the Divine Companionship in the duties he was about to undertake. There was no M.S. or notes in the pocket. But in addition to the preparation made in the fields, and in the home with the Bible on his knee, the messages he had to give were prayerfully pondered in the lanes, as he plodded the miles to the appointed places. Many of those appointments were six or eight miles distant: but they were conscientiously fulfilled. This meant some sacrifice, as for example in Harvest time, when all the other days were filled with severest toil. One thing was a perpetual pain to him, that the family resources were such as would not admit of silver, even the smallest coin, being given at the collection. Only in later life were circumstances made to bend to admit of this being done. I dare say my mother might be considered the predominant ‘partner’ in the home. But for gentleness, purity, lovableness, my father excelled. He was a faithful husband, and an indulgent parent. 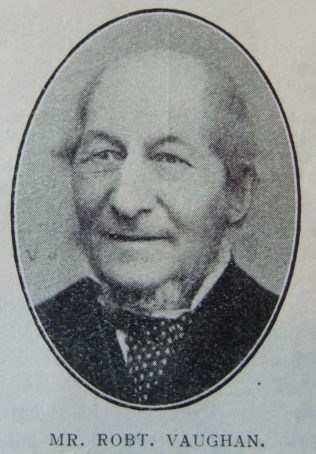 Robert was born on 15 October 1808 at Rhosygadfa, St Martins, Shropshire, to parents Robert and Elizabeth. He was baptised on 30 October 1808 at St Martins. Robert senior worked the land. Census returns identify the following occupations for Robert. Robert married Marta Powell (abt 1811-1899) on 20 September 1836 at Oswestry, Shropshire. Census returns identify seven children. Robert died in late 1889 at North Meols, nr Southport, Lancashire.